MANCHESTER – 6th September 2016: Manchester-based international business insights specialist Gama is today pleased to announce the final shortlist of products for each category of the Gama Innovation Awards 2016. Recognising outstanding innovation in the FMCG space, the shortlist for the Gama Innovation Awards covers the categories of Product, Packaging, Positioning, Branding & Design, SME and Best of Britain, representing the best innovations unearthed in the last year by Gama’s global network of in-country researchers and analysts. Gama innovation director Silvia Ruiz commented: “Each of our shortlisted finalists for the Gama Innovation Awards 2016 has demonstrated real creativity and ingenuity, showing that product innovation is still alive and well across the globe. Whether it represents an advance in packaging, positioning, design, technology or formulation, every finalist on our shortlist is a unique showcase for the very best in new product development over the past year”. The overall winner in each category, as voted by an international panel of prestigious industry judges, will be announced in a ceremony to take place at Manchester Central on Tuesday 25th October 2016. 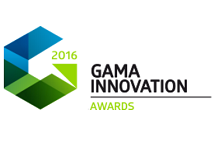 To view the full list of shortlisted finalists, or to find out more about the Gama Innovation Awards 2016, please visit www.gamainnovation.com. Gama is a global provider of business information and services specializing in product innovation. Through our worldwide network of over 100 in-country experts, we offer high-quality news, research, analysis and partnering services, delivering compelling insights and supporting you to unlock new business opportunities.